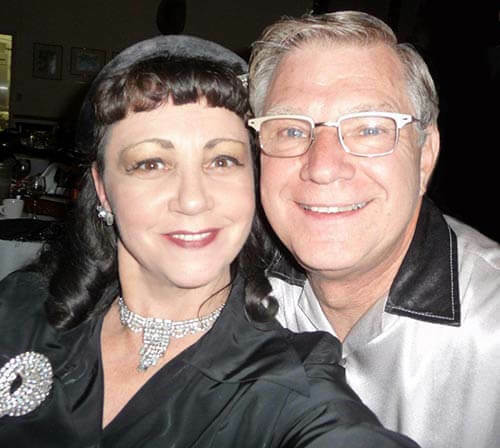 Lora and her hubby Stephen. After we ran our story about the new colorful Wilsonart Laminates, reader Lora flagged Pam down on Facebook to let her know she had recently installed the Kiwi Go Wavy laminate profiled in the story. 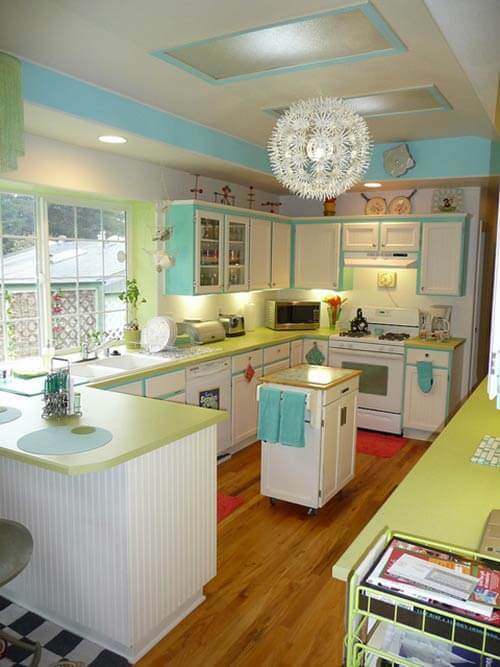 What a bright and cheery kitchen. 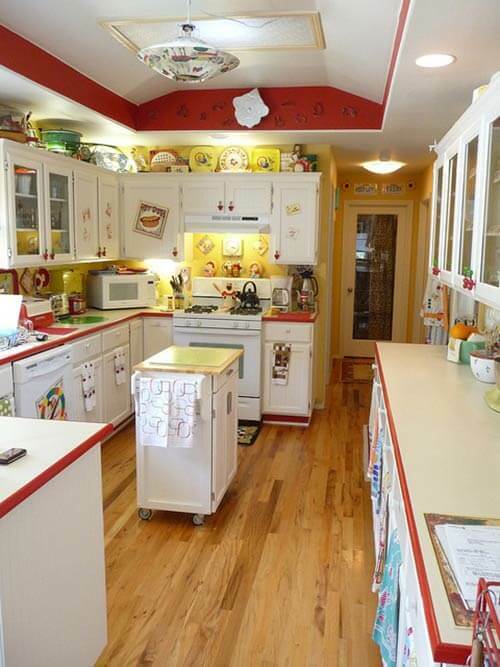 I can’t imagine you could ever feel sad when cooking, eating or entertaining in such a happy and inviting space. 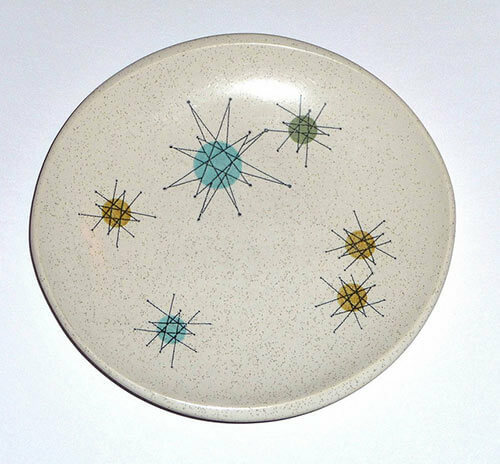 Before I renovated, my kitchen was more in the reds with a lot of Formica cherries…my new design was inspired by the star burst plates! 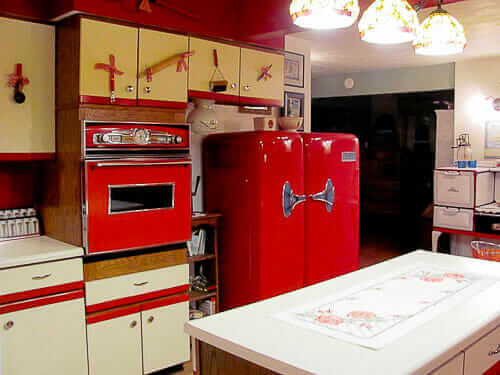 I loved my red kitchen, but after 8 years, I wanted to change our interior style to more mid century! 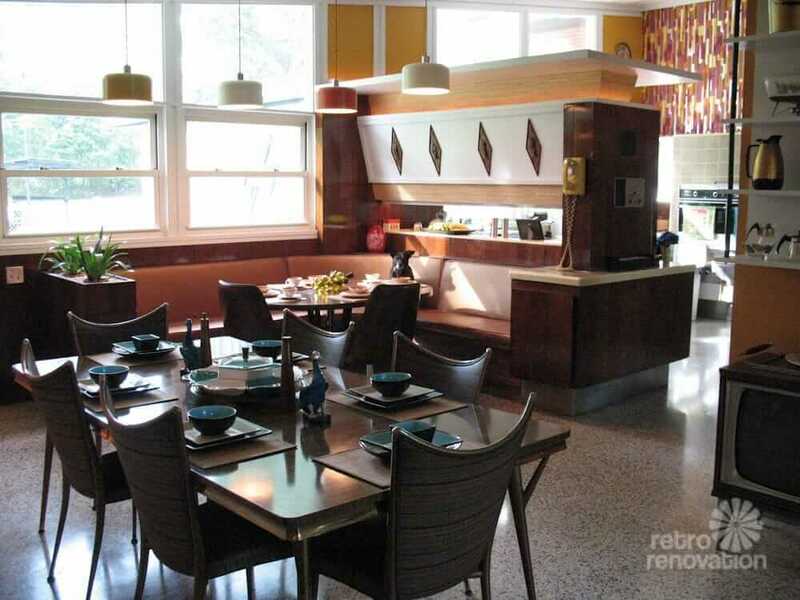 The process of renovating my kitchen went good and fast! 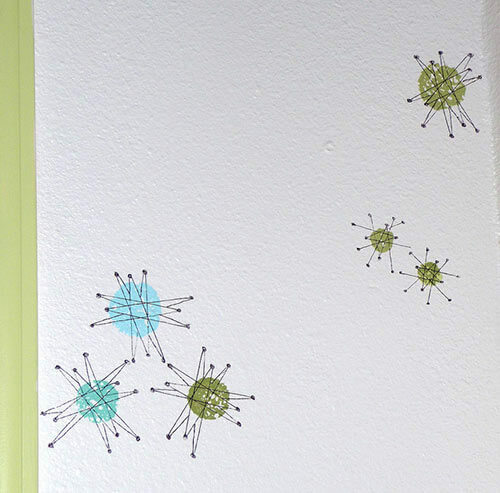 I painted the walls with the star burst pattern, and colors from my inspiration plate. Just the paint made such a change, plus de-cluttering and changing the room from the warm color collectibles to cool colors. Most things were found at thrift shops, Ikea (flower hanging lamps) and Ross were I get some nifty odds and ends. I wanted to do the boomerang counter tops, but knowing the re-sale of houses in the future, boomerang might not be something the next owner would want. I went to our local counter top biz and saw the Wilsonart Go Wavy in kiwi and fell in Love! Two weeks later, the new laminate was installed in only one day! Hurray! 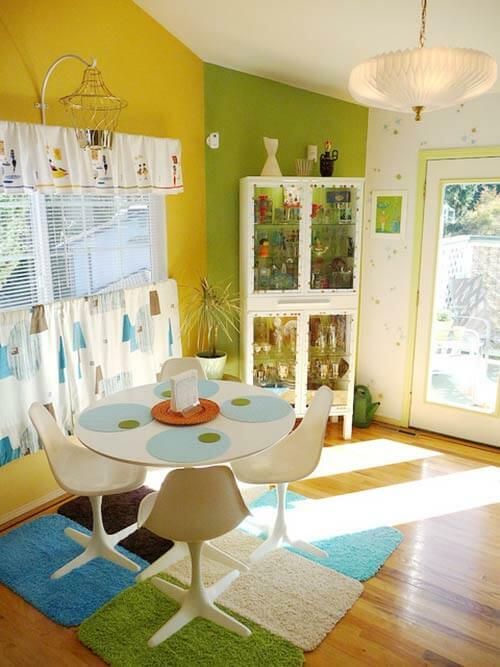 What a great way to add some mid century pizazz to your dining room, Lora — those starbursts really help tie all the colors in the kitchen and dining area together. I’ve been into Vintage for years! I’ve owned my own Vintage Boutique since 1991. A Friend offered her Vintage Boutique to me after supporting her shop for years! I do Retro Chi Design for Vintage renovations, run my Boutique for Fashions and Collectibles, and also do window design for theaters, local businesses and movie sets, in period pieces. 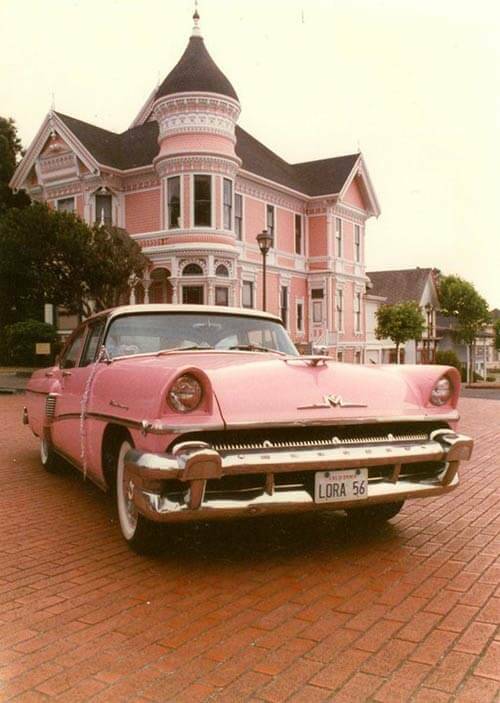 I even drove a 1956 Mercury for 16 years-which added to the fun! 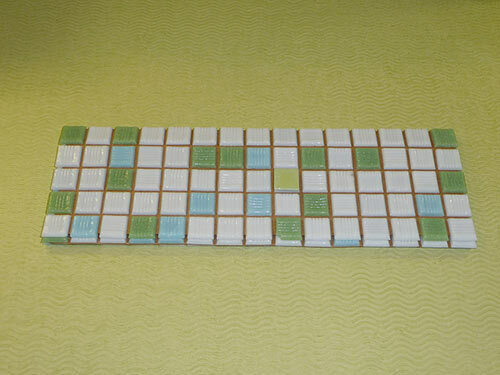 Lora’s next project for her kitchen — to install a mosaic tile backsplash (pictured above). 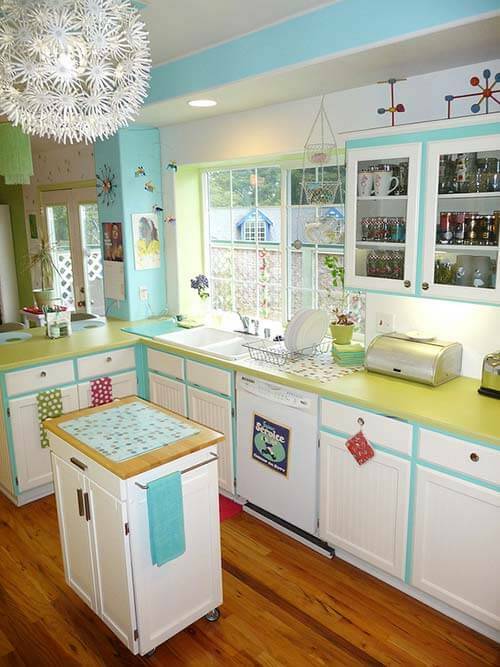 What do I love most about Lora’s kitchen designs — past and present? She was able to pull off two completely different looks. 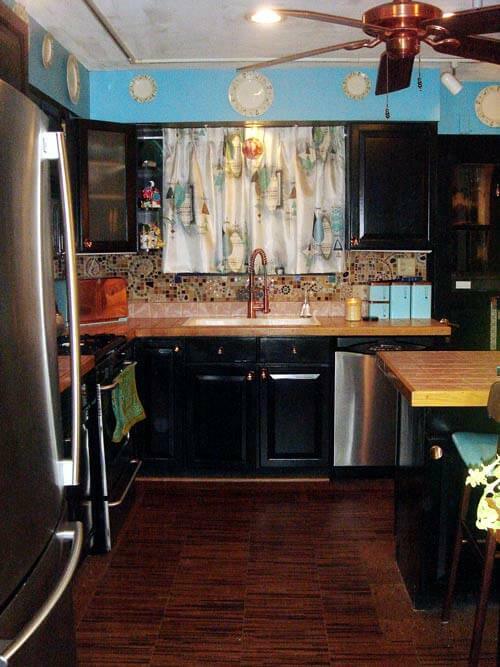 She started with basic white cabinets with a vintage feel — and with just a little bit of paint, changing around her accessories and installing different laminate countertops — all inexpensive fixes — Lora has a totally “new” kitchen. That’s creative folks — and fits into the mid century mantra of working with what you have. Bravo on a job well done, Lora — and thanks so much for sharing your photos and your story! Lora – what a cheerful, inviting space! I have a little collection of those Starburst plates and after much contemplation, have decided to change the color palate of my kitchen to tie into them as well. 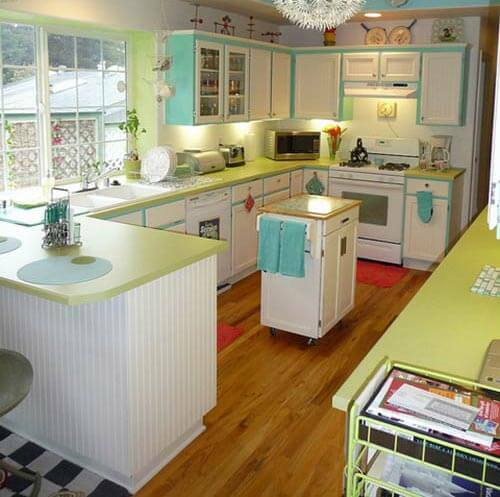 (I am starting off with already yellow cabinets.) I am impressed by your creation of the starburst googies…I have wondered if I might be able to replicate them and you just may have given me the courage to try it! Those rectangles under your table are perfect! Are they individual rugs or carpet squares? I love the bath mat idea! So much cheaper than carpet tiles or a large carpet. I’m going to have to use this some day. Loved the article! I couldn’t read fast enough! I am collecting that very pattern (Starburst) because it’s what our mom served food on! Everything looks neat, crisp, tidy & fresh. Well done…nice work. I will be looking at your photos/article over & over, that’s for sure! Thanks for sharing! very fun! i love the rug in the dining room. is that just 6 bath mats put together? hmmm. 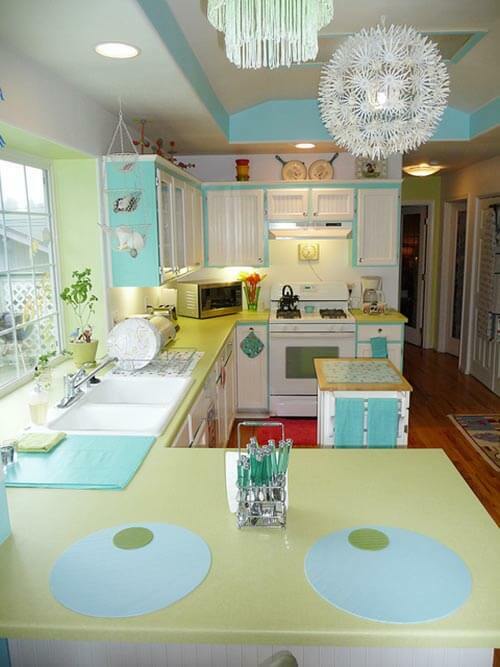 Lora – I love the colors and the happiness of your kitchen! Two questions: where are you placemats from? And the rug under your kitchen table – are those bathroom rugs put together?